Illustration 1. 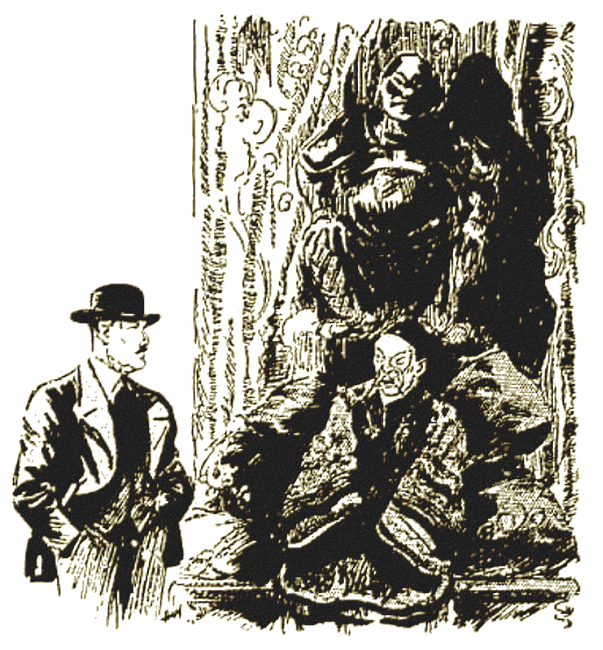 Before and beneath the idol sat an old Chinaman. Illustration 2. Rider snatched the silver flask and lifted it to his nose. Illustration 3. Yo Chai straightened, a fine diamond blazing in his yellow palm. "THE science of detection, my dear Rider, is..."
The telephone bell interrupted. Inspector Rider rose from the chair on which he had been lounging and went to the instrument; he lifted the receiver and spoke his name. Slowly the smile left his lips and wonder dawned in his eyes. For minutes he listened, then turned to his companion. "Martin T. Dreed is dead—murdered In a Chinese apartment." He turned quickly to the instrument. "What's that?" Dr. Colven betrayed no signs of astonishment. His eyebrows lifted slightly and the short legs that barely reached the carpet tapped impatiently. A smile came on the full, red lips, set in the small, round face. Rider was listening intently, a puzzled expression succeeding the wonder that had first flooded his face. At length, with a muttered "All right; I'll come at once," he replaced the receiver and faced the American. "So... Martin T. Dreed is dead." Arnold Colven, one of the leading operators of the U.S. Federal Secret Service, spoke gently. Rider nodded. " 'Fraid this is going to put an end to our quiet evening, doctor. I'm sorry, but..."
"You have been called to duty." The long, thin fingers tapped gently on the arm of the chair. "Do you know, Rider, I almost expected this to happen." He watched the Inspector, moving restlessly about the room. "Sit down, my friend. There is much to consider before we can take action." "Superintendent Vining has asked me to go to Campbell Street at once," Rider explained. "Loring has the case, but..."
"Sergeant Loring is a good man." Dr. Colven nodded. "Loring has arrested Yo Chai for the murder and Chai refuses to speak—or make any statement—except to me." "And... the evidence..." The little man nodded sagely. "I'm afraid Loring's made a mistake." Rider, seated on the edge of the desk, frowned thoughtfully. "It's absurd to suspect Yo Chai. And he doesn't report how the murder was committed—except that Dreed wasn't shot or stabbed "
"Loring found Dreed seated beside a small table—dead. Yo Chai was seated on a divan at the other end of the apartment, watching him." THE car came to a stop with a grinding of brakes before a large shop in Campbell Street. The shop was really two shops made into one, with large double doors in the centre. Before the shop stood a uniformed constable. The man saluted as Rider jumped from the car and strode to the doors, closely followed by Dr. Colven. The Inspector led through the shop to the stairs in a far corner, partly hidden by bales of merchandise. At their head was a closed door. He knocked impatiently A constable opened the door and stood aside when he saw the Inspector. They entered a small box-like room. Opposite the door, on the wall, hung a beautiful piece of blue silk tapestry, cunningly patterned in gold brocade. From, the tapestry depended three long scrolls, covered with Chinese writing in long, even columns. Before the tapestry stood a long, narrow table on which stood two quaintly-wrought lanterns. Rider passed through a door to the left of the tapestry. Now he was in a big room, hung with rare tapestries and rich silks. But his eyes went immediately to the form of a large man seated on a low divan beside a small ebony table The man's attitude betrayed that he was dead. The Inspector's eyes swept the room. In the far corner stood a huge idol with broad jowls and narrow forehead; eyes that joined with the expressive mouth in a leer of utter evil. Before and beneath the idol, on a divan piled high with cushions, sat an old Chinaman. His face was heavily creased; from the upper lips depended the few sparse hairs that made the moustache. On his head rested a crimson skull-cap with a black tassel. A loose robe, of a color midway between mauve and purple, covered him—a robe heavily brocaded with gold. Before and beneath the idol sat an old Chinaman. Close to the door stood Loring. Rider spoke a few words to him in an undertone, then strode across to the Chinaman. "Yo Chai." The Inspector spoke abruptly. "Ta hai!" Gravely the old man rose, bowing low. "Inspector Rider is my father and I am ta shih fu (your big servant)." "Who is this man?" Rider pointed to the table. "K'e pu chih tao t'a shi shui." The words were spoken softly. "You don't know him." Rider repeated thoughtfully. "Yet he is here, in your house—dead. How did he get in?" The Chinaman shrugged: "Ch'ien men?" he murmured. The Inspector stared. Come through the front door! He laughed; then looked towards the man at the table. Dr. Colven was sitting beside him, deep in thought. He looked up as the Inspector approached. "Martin T. Dreed, certainly." The little man spoke precisely. "And... he died as Cyril Q. Allerson did!" THE room was unchanged, except that Dreed's body had been taken from it. Still Yo Chai sat on his divan beneath the grinning idol. The detectives had searched the apartment; they had searched the big double house. Nowhere had they found anything they could connect with the murder—for, murdered Martin T. Dreed had been. More, the man had been drunk when he had come to the Chinaman's apartment. Yo Chai had told a simple tale. He did not know Dreed. That evening, after he had finished business, he had visited a friend. When he had left no one had been in his apartment. When he returned, the dead man was seated beside the ebony table. Now Rider knew why Yo Chai had insisted that he be sent for. He voiced the explanation, in answer to the query in the American's eyes. 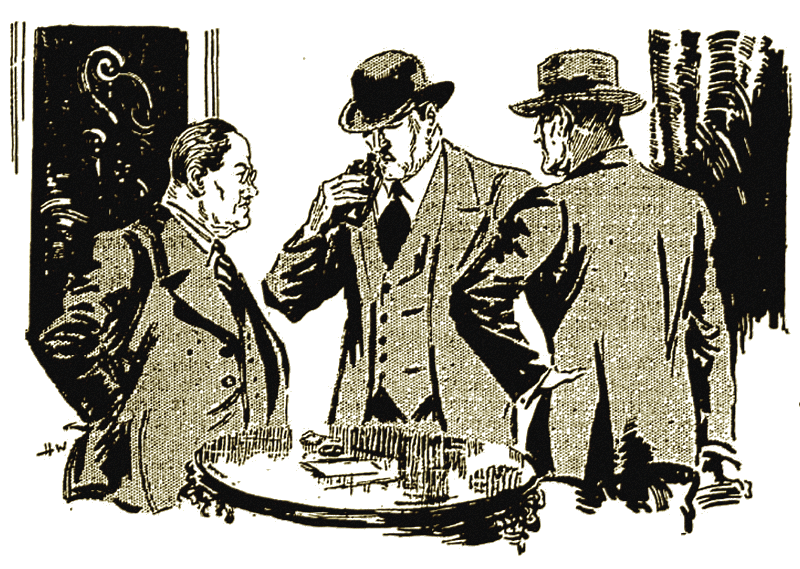 Some years before the Inspector had assisted in a raid on a Chinese gambling den. A giant Mongolian had struck him down and would have killed him but for the intervention of Yo Chai. He owed his life to the Chinaman—now the man had claimed his life from him. He knew that Yo Chai was incapable of murder. Powerful in Chinatown; immensely wealthy; benevolent and charitable; never had suspicion been cast on him. Rider turned to face the man seated beneath the grinning face of the carved, huge idol—impassive, silent, awaiting with impenetrable Oriental patience. No, two fountain pens. He slipped the caps and examined the nibs. One was wet, the other dry. He tested them—only one wrote easily, the other not at all. He turned to the remaining articles. Some bills and letters; a notebook: a handful of silver; a lighter, several cigars, black and rank; two handkerchiefs, one retaining the odor of cheap whisky; rimless pince-nez, in a case. A key-folder, with six keys, one strangely shaped. Suddenly the Inspector looked up, to see the American's eyes fixed on him. "Well?" Rider asked. "What do you make of it?" "The Martin T. Dreed touch." Dr. Colven shrugged. "We should have expected this. Still, there is one factor—;"
"Yes?" The Inspector queried impatiently. "You have not observed." The little man spoke quietly. "A coincidence, yes; but—illuminative." The Inspector watched the Federal operative in silence. The man was an enigma to him. Less than a week had passed since he had landed in Sydney. Rider had been detailed to give him any assistance possible. A strange friendship had grown between the two dissimilar men. The man was an enigma! He was totally unlike the typical American. In that city he was as Australian as the men he rubbed shoulders with; and he had a wonderful reputation. In every country he was a different man; in Paris the true Parisian; in Berlin the typical Prussian; in Rome of Italy complete. Therein lay the secret of his wonderful success. He was of all nations, of all times; quiet, unobtrusive; a background, until he had learned what he wanted. "You do not understand," the quiet voice continued. "Listen then. Yo Chai goes to visit a friend. His apartment is empty. His servant enters—to find it empty. He leaves the room. On the stairs he meets his master and receives certain instructions. Yo Chai comes here—to find Dreed. In five minutes—and the scene has changed." "In five minutes." Dr. Colven spoke again after a long pause. "And—two men were without the door, while one man, within, was murdered! "Within five minutes!" the quiet voice continued. 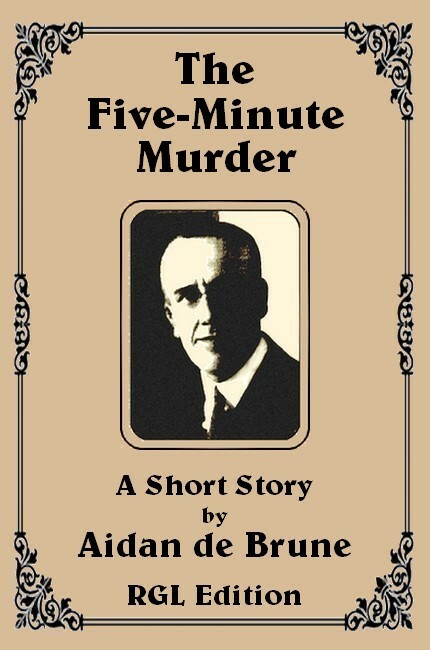 "In five minutes a man in New York died—the same way. That I have told you before. Yet, think! Arthur Bishop, of New York, left his apartment to visit a friend. His servant took into the room the coffee percolator and sandwiches—and the room was empty. He met his master on the landing. Within five minutes Bishop enters his apartment—to find a man at the table—dead." "If Dreed died in the same manner—" commenced the Inspector..
"He did," Colven interrupted. "Both men's mouths smelt of whisky—cheap whisky. Before they died they had drunk freely." "Where does Dreed enter into the AlIerton problem?" asked Rider. "To obtain the answer. to that question I traced Dreed across the Pacific." Dr. Colven smiled quietly. "You expect to find the solution here?" For moments there was silence; then Rider turned on his heel and went to face the silent Chinaman. "Yo Chai! A man dies in your room. You say you do not know him—that you have never seen him before. Can you tell how he got here—without your or your servant's knowledge?" "T'ao ch'i!" The impassive eyes were raised for a moment, then lowered again. The devil! The Inspector translated incorrectly; the words hold no white man's meaning. "Then a devil can get into a Chinese apartment!" He swung to face the American. "Colven, I'll confess, I'm beaten. Unless Loring—"
"Here lies the solution." The American's hand swept over the articles on the ebony table. "When we can read them aright '"
"Have you examined them. This fountain pen, for instance?" The Inspector snatched the pen from the table. It was weighty and large. He slipped off the cap and paused. Then some sixth sense made him unscrew the nib-holder. It moved easily. He tilted the barrel on his hand. From the pen slid a small hypodermic syringe, followed by the plunger, separate. Mechanically he screwed it into place. He scrutinised the barrel. On it were the initials "A.B." He became aware of a fine, elusive smell, and turned to the American questioningly—to suddenly face the door as steps sounded without. Sergeant Loring shook his head as he entered the room. He went to the table and placed on it a silver flask. Rider snatched it up and lifted it to his nose. It had held whisky—and with the whisky the faint, elusive perfume that had puzzled him so often that evening. On the flask he found a monogram, again "A.B." He turned to the Sergeant. Rider snatched the silver flask and lifted it to his nose. "Not a sign of anything, sir. We've had all the Chinks in the neighborhood under question, and not one of them has a story to tell—"
"I found it in the yard of this house. Can't place it, but—;"
"It is evidence," Colven interrupted. "There is the fourth factor. Two more, and—;" He turned to the articles on the table. From them he took an American telegraph form and handed it to Rider. The words on the form were few, and the Inspector read them at a glance. He swung around on the sergeant. "I want Chan Lew Toi. Comb this quarter till you find him!" Loring turned to the door. From the other end of the room came a low, whining sound, similar to the cry of a puppy. In a flash the American was on his feet. He went across the room to the Chinaman. His voice now held certainty. "Yo Chai. I want the White Mogul." Slowly the man rose to his feet. He bowed until his pigtail swept the floor. When he straightened a fine diamond blazed in his yellow palm. Yo Chai straightened, a fine diamond blazing in his yellow palm. "Then—;" Rider glanced from Colven to the Chinaman. "No." The American spoke certainly. "Yo Chai did not murder Dreed. The murderer is many miles away." Mr. Colven returned to the divan on which he had been seated. Motioning to Rider and Loring to seat themselves. he placed the diamond and telegram on the table with the other articles. "The fifth factor!'" he muttered. "One more, and I can provide that!" He glanced up at the Inspector's puzzled face and smiled. "You have not solved our puzzle yet, but you have all the clues—no, one you have not. Cyril Q. Allerson was the owner of the White Mogul." "Was?" The Inspector spoke sharply "Who is?" "Yo Chai." Dr. Colven laughed gently "Let me tell the story. Yo Chai wished to purchase the White Mogul. His agents in New York approached Allerson. A price was arranged. Allerson withdrew the diamond from his safe deposit, and it was immediately stolen from him. 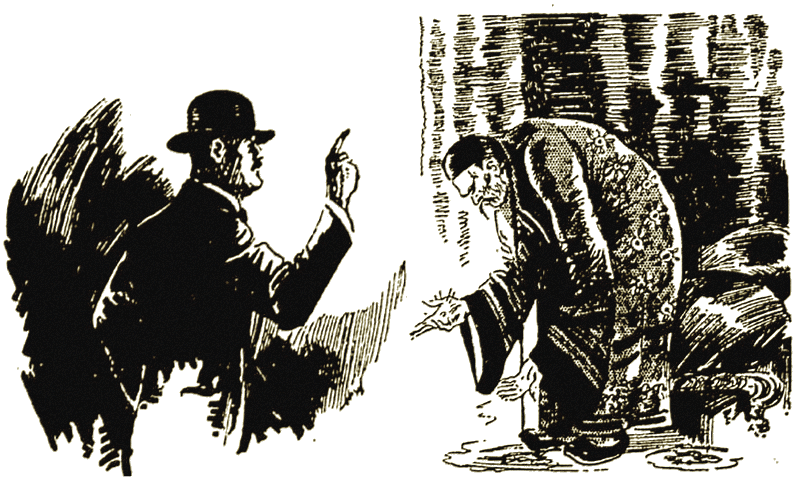 The thief left one clue, and Allerson interpreted that. He went to Bishop—and died." "What had Allerson to do with Dreed?" asked the Inspector. "Dreed desired the White Mogul," the American answered. "He learned that Allerson had lost the stone, and trailed him to Bishop's apartment. But he was too late. Allerson had recovered his treasure, true, but he had died. Others were before Dreed. The diamond had again disappeared." "Who brought it to Australia?" asked Loring. "Chan Lew Toi.'" The reply was quick. "Chan Lew Toi was Yo Chai's agent and messenger. He took it from Allerson's dead hand and brought it to his master. Dreed learned that the Chinaman was carrying the diamond and followed him. Chan Lew Toi completed his trust. Dreed waited until Yo Chai went out to-night; then came in to search for the jewel. He found it—and died." Inspector Rider frowned. The American's quick eyes caught the expression. He motioned towards the ebony table. "A handkerchief, a fountain-pen, a flask, a telegram, a letter, and a diamond. The six factors that tell the story." "Easy for you, perhaps." Rider spoke exasperatedly. "I can't make head or tail of it." "Cyril Q. Allerson owned the White Mogul. Yo Chai purchased it. Just before the deal was to be completed the jewel was stolen." "So far, plain." Dr. Colven glanced up keenly. "Bishop, the thief, left clues which Allerson followed, without calling on the police for help. In Morgan's apartment he recovered his jewel—and died." "In the same manner as Martin T. Dreed died to-night." The soft voice never altered. "Dreed desired the jewel. After Allerson's death he learned that Chan Lew Toi had the diamond, and was bringing it to Australia. He followed." "Then Chang Lew Toi killed Allerson and Dreed." stated Loring quickly. "Patience, my friend." Dr. Colven held up a warning hand. "Shall we trace Dreed's actions? We know he followed Chan Lew Toi to Australia—and I followed them both. On the voyage Dreed searched Chan's luggage—even his person. without success. Yet he continued, certain that the Chinaman carried the jewel. "Chan Lew Toi accomplished his mission. He handed the White Mogul to Yo Chai. He informed his master that Dreed was trailing him. Fearful for his treasure Yo Chai did not immediately remove it from its concealment. Dreed waited. He broke in here. He discovered the jewel. In obtaining it—he died." "Where was the jewel hidden?" asked Rider interestedly. "When Bishop stole the jewel he thought he might come under suspicion. He hid it, here." Dr. Colven raised the silver flask from the table. "To make it secure he filled the flask with whisky. Allerson discovered that the diamond was in the flask. He went to empty the whisky out, then—then the lure of the liquor overcame him; and he died." "The whisky was poisoned?" exclaimed Rider. "You have guessed." The American bowed assent. "Chan Lew Toi found Allerson with the flask by his hand. He guessed the secret, and thought the White Mogul was safely guarded. He brought the flask, and the diamond to Yo Chai, warning him that the whisky was poisoned. Until Dreed was disposed of Yo Chai thought wise to leave the diamond in its hiding place. Thus the poison-liquor claimed its second victim." "Dreed drank the whisky," Loring interjected. "But," queried Rider. "Why did not the two men smell the poison? I could—that etherised smell, you know." "Allerson and Dreed were Americans," the Federal operative explained. "And used to that smell on the liquor they obtain there. Once the spirits—the smallest quantity—passed their lips they were doomed." "Then they were poisoned with etherised whisky?" asked Rider. "They were poisoned with tetraethyl lead,"' corrected the American. "So far as I know, this is the second time only this poison has been used criminally." "Tetraethyl lead?" Rider stared, amazedly. "A constituent of ordinary gasoline," Dr. Colven answered. "It is colorless, closely resembling chloroform in appearance; almost odorless, but for the faint, elusive scent of ether; intensely deadly. More, it is the most easily obtained of all poisons—for the veriest amateur with a home-made still can distill it from ordinary petrol." "Those men died a fearful death, my friends." From his pocket the Federal operative took a notebook and opened it. "Let me read you a few lines from a report from our toxicologist's office." He turned a few pages. '...The oesophagus, for example, and the entire trachael tract appears as, if it had been played on with a blow-pipe'." Dr. Colven rose from the divan and picked up the White Mogul! He crossed the room to the seated Chinaman, then half-turned to face the detectives. "With your permission, Inspector Rider"—his formal words belied the twinkle in his eyes—'I will now restore the White Mogul to its rightful owner, Yo Chai."